I recently enjoyed a Thanksgiving dinner with family and friends, but you wouldn’t believe what happened to me. Family and friends are huddled around the table. Vegetables all laden with seasoning and extra butter. The gravy is calling me. I bite into the largest piece of meat. I have never eaten goose before- this may be the first and last time. The goose came from our friend who happens to be a hunter. It’s not my thing, I have never hunted. VITAMINS. Vitamin C is used by many alternative practitioners for dental disease. It is an immune stimulant and helps the production of normal gum and teeth tissue. The starting cat dose is 100 mg daily. The starting dog dose is 100 mg per 10 lbs daily. If your pet gets diarrhea, lower the dose. SUPPLEMENTS. For cats with recurring gingivitis, lactoferrin can be helpful. The dose is 1/2 a 350 mg capsule daily mixed in syrup or baby food. Propolis is a product of honeybees and is an oral antiseptic. It is applied topically to the inflamed gums. PLAQUE OFF. This is a completely natural product which is suitable for both cats and dogs. It is a special type of seaweed which has been found to have specific beneficial effects for oral care. It comes in a granulated form which is easily added to food every day. It is rich in natural iodine and contains important vitamins and minerals and is free from artificial colors, preservatives, gluten and sugar. You can get more information here: www.plaqueoff.com. HERBAL TINCTURE. A tincture of OREGON GRAPE, GOLDENSEAL and MYRRH can be liberally applied to your pet’s gums with a cotton swab. ARNICA. For acute pain/injuries to the mouth or teeth. I have used it myself for a tooth root abscess. Dose 30C, 4 times daily. P.P.S. I was popping the Arnica after chewing on the pellet. Today I am going back to the dentist.. I can relate – I’ve never liked goose – and I remember about 18 years ago, when I broke my tooth eating candy – my nephew, who was 2 at the time, still remembers “Auntie Ev’s broken tooth”Actually, all the best things about a turkey dinner are the side dishes – stuffing, gravy, mashed potatoes etc. Bummer about your tooth! That would be my luck. Thank-you for the pet dental tips though. I recently took in a stray Tom cat. At times it looks like it hurts when he eats. He is a young cat. I’ve mentioned it to my vet but I think she thought I was goofy. I’ll have to give some of your suggestions a try. I hope that your dentist is also holistic because if you get that teeth fixed with amalgams then you are filling your body with mercury which is toxic waste. I hope you do not require a root canal but I wish you well in your recovery. I too have suffered broken tooth and it is no fun. Sorry to hear about your dental, accident. Here’s a suggestion that would have avoided it altogether. Eat vegetarian or vegan. My wife, who grew up on a farm in Vermont, put it this way: “We did not eat our friends.” That included cows, chickens, ducks, horses, etc. We live in the UP of Michigan with a deer population which greatly outnumber people. Seeing the beauty of deer, bear, wolves and birds in flight, we cannot understand how anyone could kill for sport or to eat. By the way, a vegetarian lifestyle is completely consistent with your focus on holism. i hope you and your tooth are fixed up soon. happened to my when i was a kid..we were visiting someone and i guess they shot the duck themselves but didn’t mention to watch out for the pellets until after i chipped a tooth. and thanks for all your informative emails. Ouch! I feel for you. As I sit here typing this I have a horrible toothache and am wondering how I can pull it myself as I don’t have funds for a dentist. I hope you were able to eat your dinner still? Sounds yummy. I’ve never had goose before. Gun nerds are always toting “responsible gunning”, but I see so many deviations from that, and this is just one more instance. Are those beads made of lead? Then you have another problem in ingesting a poisonous substance. Ouch, is right!! I’m not much into wild game, or any wild animal for that matter. However, I loved the way you told the story…..What a way to ruin a perfectly good meal!! I know someone who has 3 pet goats…they say that next month they will slaughter one for them to eat…. (1)I didn’t know you could eat goat, and (2)I could never be a ‘farmer’ because I couldn’t kill an animal I had raised. Many times I have bitten into a piece of meat, whether it be a stray bone, piece of arrow, and yes, a stray pellet in a so-called gosling. 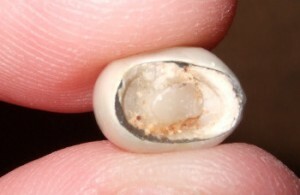 I am familar with your dilemma, so sorry this had to have happened, to lose a tooth in this manner. Going vegan is not my forte, love beef and chicken, but like you have learned my lesson eating goose. Sorry your Thanksgiving was spoiled and that you have to deal with a broken tooth. That HAD to hurt! @Lisa: Greek people eat goat and sheep all the time. I would say your friends don’t have “pet” goats. They are raising livestock to consume. NOBODY could eat their “pet”. Just ask your friends if they would eat their dog or cat…or horse if they have one? I’m an inveterate omnivore, but if I had to personally kill and dress any mammal (or avian for that matter) to eat I’d rather nosh twigs and bark. Sooo sorry to hear about your tooth! I too know what a broken tooth feels like and it’s NO fun. Wishing you a super-speedy recovery and I hope that your dentist is just half as good as you are. If that is true, well then, you are in GREAT HANDS. Thank you so much for all you do and all your info you so freely share with your fans. My animals and I want to send you love and health. Again, Thank You. I like Ole’s comment and views best, can I come be part of your family? That is exactly how I choose to live and yet every family gathering I am peppered with frowns and what is wrong with you? because I choose to eat vegetables only and not the meat dishes. They will think different when they are laying on the stretcher waiting to be rolled into the OR for their heart bypass operations. There are many organic farmers, Lisa, who raise critters for their meat, and they give them a much better life than goats on a factory-type farm. With the current “Locavore” movement, inspired by Michael Pollan, who says, “Eat real food, not too much, mostly plants”, people want to know *where* an animal for their meat was raised, if it was fed grass and other natural diet; how their vegatables were raised, and so on. Locavores like to patronise local farmers if at all possible to encourage community cohesiveness and cooperation. Those of us “who can’t give up meat” can reduce our beef consumption to one or two times a month, b/c the production of beef takes more land and water than any other animal … reduce all meat consumption by using meat as a “seasoning”, for example, using bits of bacon in a parmesan-cheese based pasta dish … use just bits of chicken in a big, delicious Caesar Salad. And I too thank you for the dental tips. I have a miniature dachshund who is a gold medal olympic plaque producer…it’s unbelievable. He’s 15 so I’m pretty much done with the professional cleanings and I’ve tried a lot of different things but I am willing to look at the plaque off…does the herbal tincture mixture you referred to have a brand name? Dr. Jones, what do you think about ionic silver water or colloidal silver for gum problems in dogs and cats? I have a problem in my gum under a tooth that was filled many years ago. The dentist did something wrong as I couldn’t chew on that side for a year afterwards, but neither he, nor a subsequent dentist, could find the problem. A couple of years later, it became very painful. One rinse with ionic silver water took the pain and infection down, and rinsing daily took it away. I used to have to rinse every day, now only about once a month if I feel it become sensitive. I’m convinced that without it, I would have had to have some type of dental surgery. My oldest dog recently had a problem with a swollen gum. The vet said abscessed tooth, but then I pulled a piece of speargrass from her chin, directly underneath where the swelling had been. He also said her remaining teeth were rotten, even though I had them cleaned and 17 teeth pulled a year ago. I have been brushing her teeth ever since and rinsing with ionic silver water, and she seems fine, happier, and the swelling has not returned. What do you think? If a pet has bad teeth and inflamed gums, would you recommend ionic silver water or colloidal silver? Thank you so much for the dental advice, BTW, I’m definitely going to try it! Hope the tooth is better. Broke a piece of mine off twice in a year eating pizza crust – now give the crispy crust to my dog so we share and are both happy. OMG! Those bullets/pellets look ugly! I think it is disgusting that you broke your tooth because the bullets/pellets were lodged in the meat. I despise hunters and hunting. I am an animal lover and can’t understand men/women that go out and kill animals for their “jollies.” I say, “Leave the birds and wildlife alone!” Take care of yourself, Dr. Jones. You are a wonderful vet; I feed my dog, Gus, your supplement. He is a very healthy, large Yorkie with beautiful shiny, silky fur. I hope your dentist appointment went well. Sylvia, Gus, Liam, Riley, and Skye (+ five eggs). Sorry about the tooth. Thank you for everything you do, you have helped me more than you could ever know. I have 3 rescue dogs, and a cat that we rescued from certain death and kept her even though she has lots of problems. We love them all and we do what we can to keep them healthy abd happy. Many Blessings to you and the family. So sorry about your tooth. I really appreciated the info about plaque. my 11year old Papillon keeps building plaque and I do not want her to have anesthesia for dental work. She has had many teeth pulled already. Eyi, not a fun way to eat a Thanksgiving dinner… the anticipation was exciting though I bet 🙂 Dental health for pets, oodles of importance! It’s not only infection and tooth loss that I think about with dental diseases, but the real pain a pet will experience. Greenie’s dental chews are quick and easy. You still must brush their teeth, but giving something like the above on a daily basis is awesome. That is a most unfortunate incident and I hope you are feeling better currently. Perhaps next time you eat any game a metal detector would prevent this form happening again. Maybe you could take the goose to a place that has one or even buy one. Seems like it would be lesss expensive than another crown.